The Rev. William Piletic joins the Advancement staff as alumni chaplain. DePaul University welcomes the Rev. William “Bill” Piletic, C.M., to the Office of Advancement, where he will serve as chaplain for alumni, donors and the university community. 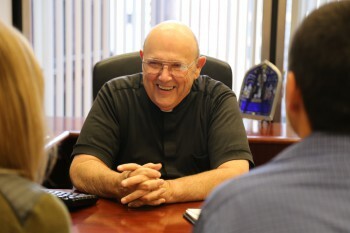 Piletic first came to the university in the 1960s and now returns after 50 years in Los Angeles where he was working with a small parish and other houses of prayer as needed. In his new role, Piletic will serve as a liaison for the alumni community and will attend regional and local events and events throughout the Chicagoland area. As this is a brand new position in advancement, many of his responsibilities are still to be determined. He invites the DePaul community to contact him and let him know how he can be of help. For more information, contact the Office of Alumni Relations at dpalumni@depaul.edu. You are currently browsing the DePaul Advancement News blog archives for October, 2014.